Bus Route 75 stops in Boonville at the Redwood Drive-in at 9:55 am on it's way to Ukiah. You can flag the bus down anywhere on Highway 128 where there is a broad turnout. You should not rely on this site for current information. but may change without notice to this site. For current information call MTA at 800 696-4682 or click here. 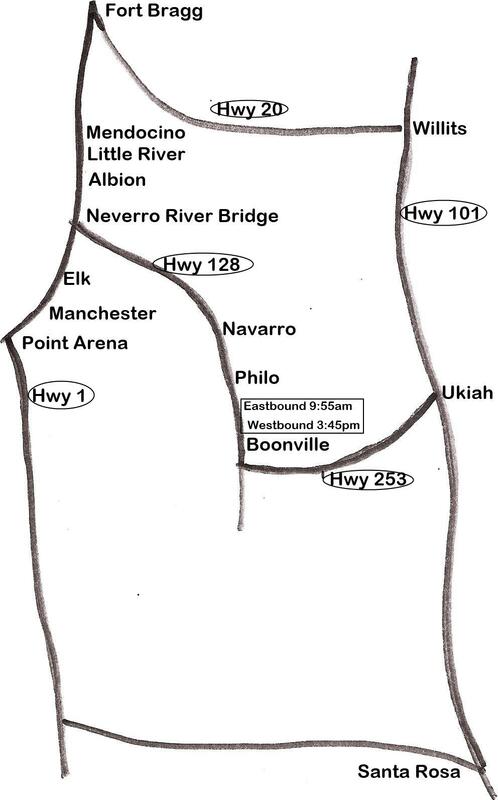 The Map below gives a rough idea of the bus routes. Map is to perfect scale! If you believe that I have the Golden Gate Bridge for sale.